Will we be burdened by technology, or will it free us? Kleiner Perkins analyst Mary Meeker has used a new term to describe our emerging tech world: "asset-light." The slide shows us this idea in a snapshot. You can know a lot and do a lot with few encumbrances, and consumers are adopting asset-light behaviors rapidly. With that idea, she has given a name to one of the central concepts of statelessness. 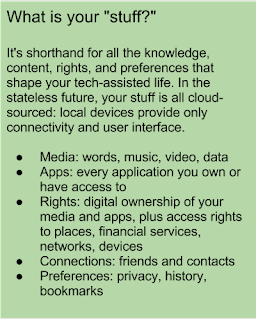 In the stateless future, data, applications, and device have been decoupled from each other. Because everything's always available, on every device, asset-light behavior is a natural outcome. My take on that idea is this: consumer behavior is already anticipating that future, but our applications, operating systems, and devices have yet to catch up. It's a simple concept; asset-light behavior is setting our expectations, creating the next wave in our bigger "life with technology" picture. To fully realize those expectations, it takes stateless apps, data, and devices. The stage is set for an explosion of "everything, everywhere, all the time." The next wave? In 1980, Alvin Toffler's "Third Wave" postulated that humanity has gone through major eras, which he called "waves." Toffler said we have been through waves one and two: agricultural and industrial. We were all embarking on the third, the information age, which is still emerging. Computing, central to the information age, has had waves as well. Mainframe: You go to your stuff, which is immovable and unshareable. Client-Server: I carry all my stuff with me, often spread across many devices. Stateless future: I don't carry any of my stuff, but I can get all of it whenever I want. This "whenever I want" idea drives the benefits of statelessness. It's the thing that makes it possible for us to be "asset-light." 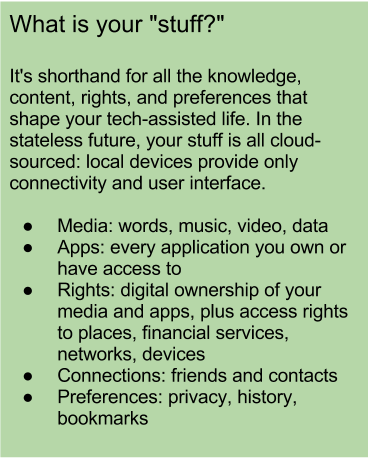 In the stateless future, everything you own is available on every device in every location: phone, tablet, laptop, TV, store, car, airplane. Because everything you need is everywhere you are, you and I will no longer be bound by the need to lug it around. Once the apps and data are independent of the device, no one need ever again carry a complete data center with them. When you think about it, that's really the the central idea of fat OS laptops, tablets, and phones; they're all little self-contained packages of computing power, operating system, apps, and data: legacies all the way back to the first PCs and sneakernet file transfers. There are two early exceptions, stateless devices from Google (Chrome OS) and Mozilla (Firefox OS.) The stateless future promises we'll have all our stuff with us without the burden of the packed briefcase carried by the businessperson on the left in the photo above. Asset-light behavior--acting stateless but with "all my stuff with me" technology--comes at a huge cost. The legacy of the client-server model shackles each of us to security risks, incredibly frustrating app and OS updates, needless cost and complexity of devices. Even with media and data files in the cloud, synchronizing multiple local copies to support the old model is practically stone age. The thing is, almost the entire mobile and consumerization movement, which appears revolutionary, is still just a kludge to get us to asset-light stateless behaviors because the background architectures of applications, data rights, storage, and operating systems have not caught up with the way many of us already live. This is a fascinating way to think of technology. We have created the tech equivalent of cognitive dissonance; the way we live and the technologies that we use to make that life possible are not in line with each other. In my opinion, the idea of an asset-light generation is a solid marker that the stateless future is destined to become real. Meeker's presentation, from last December at Stanford, is here. The description of the asset-light generation begins on slide 59. This link will run a search of all the Infrics.com coverage of the stateless future, sorted by date, most recent first.